Kings general manager Rob Blake said that defenseman Dion Phaneuf had been on the team’s radar for quite some time as far as a potential acquisition before the deal that landed him in Los Angeles last Tuesday. “We’ve been trying since the draft, we’ve been talking regarding that. It was a situation I think fit both teams – a little bit of cash savings obviously in Ottawa, similar cap hit contracts going both ways at the end of the day. So it’s something we’ve been talking about for a while,” he said. Overall Blake seemed happy with the return of adding the rugged blue liner and forward Nate Thompson in exchange for Marian Gaborik and Nick Shore. In his opinion, the move solidified the Kings’ defense – a spot he saw as a position they wanted to upgrade. As for Thompson, Blake is familiar with the forward’s game, having seen him plenty as a member of the Anaheim Ducks for the previous three seasons. In the past when the Kings have been successful, they’ve had players like Thompson on their lower lines, which is why Blake wanted to add him. “I think traditionally the fourth-line centers we’ve had here with the penalty killing role but character also and hard to play against, a lot of those components. I think will fit in here well,” Blake said. The only major issue with Phaneuf specifically is that he may not be able to get into the lineup right away for the Kings because of immigration issues. This is similar to how Los Angeles had to wait for Torrey Mitchell earlier in the season after he was acquired from the Montreal Canadiens. Thompson is from the United States, so he won’t have a problem with stepping into the lineup right away. 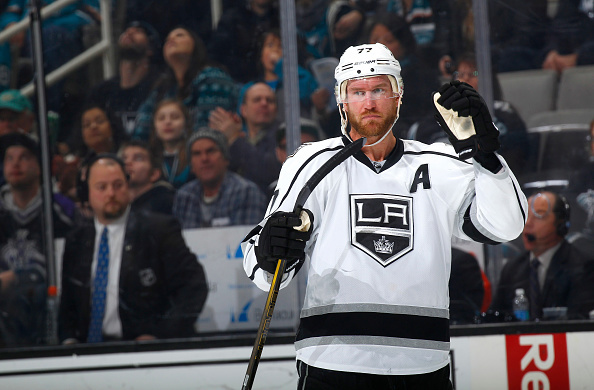 – As for other news and notes, Blake sounded optimistic that forward Jeff Carter, who has played six games all season because of a deep cut that required surgery to repair a tendon in his ankle, will rejoin the team at practice when the group returns to Los Angeles next week. In some respects Carter could be the team’s best trade deadline acquisition since the Kings need an offensive boost and Carter should give it to them internally. “I think when you add a player of Jeff Carter, that we already know and we know where he fits into our lineup, it moves everybody around and into the right spots. We’ve had a lot of guys having to play out of position this year in the middle. It’s no secret,” Blake said. – In regards to the trade deadline, Blake noted that the team needs to score more goals, but he doesn’t want to give up young assets. This is because Blake has put an emphasis on trying to restock the Kings’ prospect cupboard and not give up on the future to go ‘all-in’ on now. “If something comes that is realistic – I’ve read the kind that quantify trades as a hockey trade or not, if it’s a hockey trade that makes sense, yes. If it’s a rental, no,” he said. – Blake classified forward Trevor Lewis as having an “upper-body” injury and said Lewis was “week-to-week.” Last Friday, Lewis slammed back and shoulder first into the boards at BB&T Center in Florida after being hit by forward Jared McCann. Blake did point out that Lewis did not suffer a concussion.